Have you found your soulmate? What's on your lover's mind? Are you on the right path in your career? Call Sophia Elise and uncover the truth! Sophia is an internationally renowned five star relationship and soulmate expert, intuitive life strategist and Master Psychic. Sophia will tell you where your relationship is headed or if your significant other is returning. She will also guide you on steps you can take to make sure your relationship fulfills your expectations. Sophia can help get your relationship on track so you can create and maintain the relationship you desire and deserve. Sophia is descended from a very long multi-generational ancestral bloodline. Initially tutored by her Welsh-Romani great-grandmother, she has studied metaphysics, the Tarot, meditative dynamics, ancient religions, philosophy and the mysteries of the universe for over 30 years.  Where is my current relationship going?  Am I with my soul mate?  Why is there so much chaos in my life?  What is my life purpose and why am I here?  Is my financial situation stable? Sophia has 25 years experience with an international clientele helping them identify and remove blockages and obstacles keeping them stuck and preventing them from achieving their full potential in life, love, and career. Sophia can help you see the blockages in your life so you can can blast past what is holding you back from living the life you want to live. 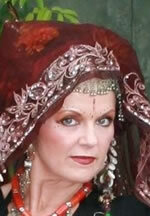 She has studied metaphysics, the tarot, and comparative religions for over 30 years. Sophia is CLAIRVOYANT, CLAIRSENTIENT, EMPATHIC, and INTUITIVE and uses the TAROT as a tool to higher consciousness. Sophia is also a medical intuitive, Reiki Master and Silva Mind Control graduate who can locate energy blockages that lead to disease within the physical body. Call her today - together you can find the best path for your own personal happiness on your journey through life. Sophia Elise is unavailable ... but you can arrange a call back!